A fiercely loyal armed force is essential to cementing a dictatorship, and the sheer military might of Cambodia’s Hun Sen, a former Khmer Rouge commander who has ruled the country with an iron fist for 33 years, should come as a surprise to no one. Yet many of Cambodia’s top military men are largely faceless, at least to most of the world. But a Human Rights Watch report last week sought to cast a spotlight on Cambodia’s so-called “dirty dozen” – 12 key figures in the uppermost echelons of the armed forces and policing apparatus who have allegedly committed rights abuses and crimes against humanity in the service of their strongman Prime Minister. These 12 men are the backbone of an abusive and authoritarian political regime over which an increasingly dictatorial Hun Sen rules … Most of the 12 have been implicated in the use of unnecessary, excessive, and sometimes lethal force against protests about unfree and unfair elections. Many have also been accused of murder, torture, and arbitrary detention – allegations the Defence Ministry denied – with some alleged crimes in service of the Khmer Rouge regime in the 1970s. This core group of henchmen entrenches Hun Sen’s power. Each is an inner-circle member of the ruling Cambodian People’s Party (CPP) and has privileged allegiance to the party above duty to the people – a key component in the CPP’s electoral victories. It seems military clout will once again play a role when Cambodians go to the ballot box later this month. Perhaps nowhere is this more apparent than in recent investigations into electoral rigging, which revealed that thousands of soldiers had been deployed to new districts, ostensibly to bolster the CPP’s vote in key opposition seats but a moot point after the government eliminated the only viable opposition party last year. The invention of such a crazy report from this group is the violation, again and again, of the sovereignty, independence and rule of law in the Kingdom of Cambodia, to serve evil politics of some foreigners and treasonous politicians who attempt to make a colour revolution. The catch-cries of “treason” and “colour revolution” have been used to silence and shutter Cambodia’s only legitimate contender for this month’s national election. 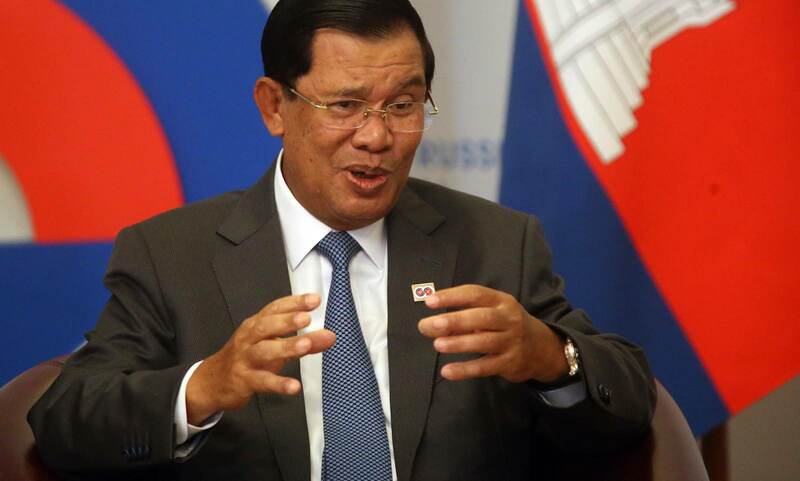 The Cambodia National Rescue Party’s leader, Kem Sokha, was arrested in September last year, and his party forcibly dissolved by the courts two months later. That provoked opposition figures in exile to call for boycotts of the “sham” election, which some transparency groups have declined to monitor. The government dubiously claims that 50,000 international observers, including some from China, Singapore and Myanmar, will monitor the polls next month. The dismantling of the opposition shows a marked shift away from the bloody tactics of 20 years ago, when many of the “dirty dozen” were implicated in a wave of political violence. In 1997, a grenade attack on a rally led by opposition figure Sam Rainsy killed at least 16 and injured 100 more. A few months later, Hun Sen staged a violent coup, overthrowing his co–Prime Minister and seizing full control of the CPP by quashing factional rivals in the ranks. In the contemporary era, the government has instead pivoted towards a strategy of “lawfare”, or creating laws to target the opposition. It’s a less bloodthirsty way of eliminating political dissent, and the legal semantics give a patina, however thin, of legitimacy. Paired with this is Hun Sen’s full-blown venture into myth-making. His official title – “Samdech Akka Moha Sena Padei Techo Hun Sen” – literally translates to “Princely Exalted Supreme Great Commander of Gloriously Victorious Troops”. For three decades, the man with humble beginnings as a pagoda boy has been crafting a cult of personality, a project that has reached hagiographic levels in recent years, in part due to the rise of social media use in Cambodia. In a country of only 15 million people, Hun Sen has amassed some 10 million Facebook “likes”, although the legitimacy is questionable, and is the fourth most “liked” head of state in the world, behind the likes of India’s Narendra Modi. He has also taken to handing out envelopes containing crisp 20,000 riel notes (US$5) to more than half a million garment workers – and $200 to pregnant labourers – during scores of speeches over the past year. This soft-power push is not to say violence has been done away with, only that such military might carries more weight in restraint, in its constant potential, when it is meted out sparingly. The threat of physical harm and extrajudicial killings at the hands of the police or military, who are untouchable in a pervasive culture of impunity, is ever-present in Cambodia. And violence is embedded in the rhetoric, in Hun Sen’s vow to “eliminate 100 or 200 people”, or Tea Banh’s declaration that his forces would “smash teeth”. Almost two years ago, political analyst Kem Ley was gunned down in a brazen daylight attack, which many suspect was a state-sanctioned hit. In March, security forces shot villagers in Kratie over a land dispute with a rubber plantation tied to Hun Sen’s family. Deaths were initially reported but the government stridently denied fatalities, which to this day remain unconfirmed. Last week, in one of his rambling speeches, Hun Sen told a crowd of factory workers that if he failed to deliver on his election promises, “please all of you stand up against me in a rebellion to overthrow Hun Sen – I am serious, I am not kidding”. But such a suggestion is laughable. Such an uprising would be snuffed out before it had any chance to swell. The government is already making arrests for individual Facebook posts, effectively policing opinion and thought. In the current climate, a rebellion would ultimately fail because Hun Sen’s loyal men are the ones holding the guns. The Human Rights Watch report alleges they are willing to use them.